Thanks to Global Influence and beyond coastal, I was able to get a head start on my summer sunscreen stockpile (say THAT three times fast!) And keep reading...because you will be able to also! And with a motto of "Protects~Nourishes~Repairs~Hydrates", you can't go wrong with these beyond coastal products! I'm already liking the clear, water-resistant Active Sunscreen for my long runs on sunny weekends. 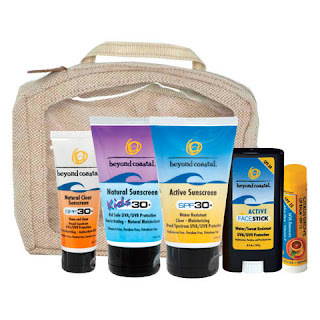 Want to win a prize pack of beyond coastal of your very own? Simply leave a comment telling me what your family's favorite fun in the sun activity is and you will be entered to win this sunscreen prize pack! Winning comment will be chosen on Friday, May 11th. Product was provided to facilitate this review and giveaway. As always, opinions expressed are my very own. My family's favorite outdoor activities tend toward triathlon training. With teenagers for children, a group ride is so much fun. Running, well, I'm the slow one, but the idea is fun--just to be out with my family! For fun in the sun as a family, we like to ride bikes. Even the 3yo gets in on the act with her Like-a-Bike! My family's favorite sun activity is going to the local park where they have a little zoo, a separate petting zoo, a carousel, pony rides, and a huge playground! We love having family and friends over for BBQs. We love playing a game of catch with a ball by the beach. My family loves to go to the beach when we get a chance! The kids love to play at the lake with their cousins--on inner tubes, rafts and throwing balls around. With a three year old and a nine month old, it's good olds fashioned fun in the backyard with a swing set, bubbles and sidewalk chalk. We love fun in the sun in the backyard - kiddie pool, sand box, and lots of toys! Me: running; husband: frisbee; 3-yr-old: biking; 1-yr-old: scootering. But mostly just playing outside in the yard or wheeling around the block on various small vehicles. We are total beach people! Just love spending a day at the beach soaking in the warm sun and cooling off in the water. Always looking for a good quality sunblock to apply to my kids that won't irritate the princess's sensitive skin. Our family loves to be outdoors. Our favorite spot would be the beach or the lake!! We like going to the pool or playing in the sprinklers.